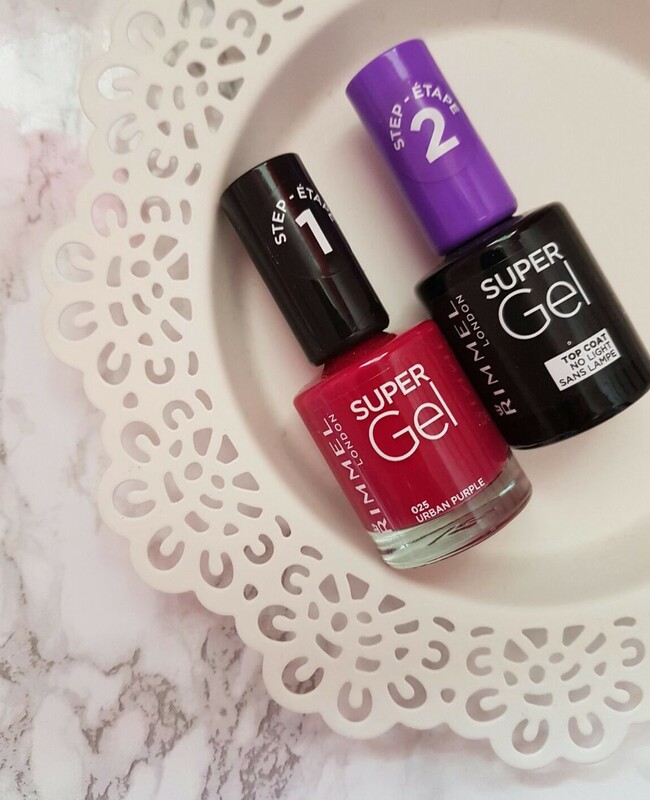 Happy Monday lovlies it’s time for another Mani Monday nail varnish review and today its of Rimmel’s new Super Gel range and the colour I chose is Urban Purple. I got this when they were first released and they only had about 5 colours to choose from but now they’ve released loads so I kinda wish I waited but nonetheless this is quite a nice colour – a hybrid between burgundy and purple. Rimmel have made this a 2 step process with a colour coat and a top coat you must buy to use with the varnish for it to have maximum effect. It claims to last 10 days which is as long as a salon gel polish. When I bought it they were on offer for 2 for £10 but they are only £5.99 usually or you can now get them in a set together for £8.99 so I think I was ripped off a bit there! The brush with this varnish in the colour pot is a bit pointy and isn’t great for applying a smooth line so you need a very steady hand to get it looking nice along the edge of the cuticle. Nonetheless the actual formula is smooth and applies fine if you have enough on the brush. The application of the top coat was a little easier as the brush is wider. Each coat takes about 5-8 mins to dry and that’s ensuring it is fully dry and not tacky so I was impressed with this. It finishes very shiny and does look like gel polish! The next day after applying this (I applied it at night) it wasn’t as shiny and it actually chipped after one day and continued to chip off more at the edges and crack all over and I wore this for a max of 3 days before I had to remove it because it looked shabby. It doesn’t remove well either it’s stubborn and then it leaves a mess all over the cuticles which were hard to remove. I am actually disappointed with this gel which is sad. When I first applied it I was impressed with how shiny it was and how quick it dried but after it chipped the next day and continued to get worse I was quite upset especially as it claims to last 10 days!! So I probably won’t purchase any other colours as it definitely does not last as long as it promised and as far as I can tell I am not the only blogger to think that! My advice? Don’t waste your money. Have you tried this? What did you think? Let me know below! I always love your honest reviews! I will definitely be avoiding these. Hi I tried the shade Punk Rock, it lasted 2 days before chipping and I was very careful keeping my hands out of water etc, I can get 5 days out of the Rimmel pro range but this one 2 days max. I’ve complained & returned them to Rimmel which I’ve never done before – just because I was so annoyed at their 14 day claim which seems impossible to me plus the £5.99 price tag I think it should be revised as it’s an awful product. I tried this and got 7 days out of it by topping up the top coat once half way through. I left it a couple more days and suffered horrendous cracking. By the end of 9 days I removed it but was still quite impressed. However I just bought a models own one that claims to do similar things and it chipped the very next day!